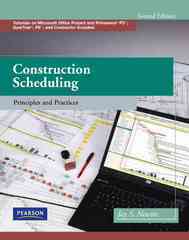 Construction Scheduling: Principles and Practices 2 Edition This text is a comprehensive, stand alone reference for project management scheduling. It features a unique combination of principles/fundamentals of scheduling and project management along with practical applications and tutorials of the 4 most common scheduling software programs–Microsoft Project, Primavera Project Planner (P3), SureTrak, P6 Project Manager and Contractor. Having scheduling information and software instructions in one book obviates the need for two texts, and the exercises and examples in the scheduling portion are tied to the same exercises in the software portions.